Broken Arrow Cabin is located near Millersburg and Zanesville in the heart of Ohio Amish Country. Private hunting cabin property for outdoor recreation activities for the Sportsman and Family Vacations. We welcome hunters and sportsmen hunting for Whitetail Deer, Wild Turkey, and Waterfowl in Ohio at nearby public hunting lands. Enjoy catch and release sport fishing in our fishing pond stocked with Largemouth Bass, Bluegill, and Rainbow Trout. Our cabin rental and property is a true Ohio sportsman's paradise and family vacation getaway for those looking to enjoy the great outdoors and Ohio wildlife. The cabin and property are also the perfect placed to stay for romantic weekend getaways. Bring your family members for Ohio Youth Hunting Seasons. Hunting for does and bucks is a true outdoor adventure for youth hunters. Wild Turkey beard busting in Ohio. 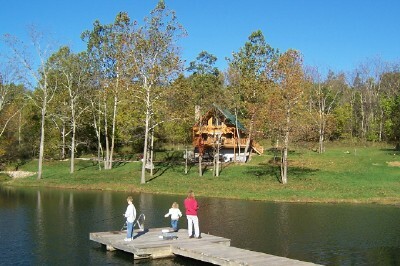 Ohio vacation cabin rental for family vacations in Ohio. Sport fishing on catch and release private pond on 100 acres of private land. Located near 30,000 acres of public hunting land for the Ohio wild turkey and white-tail deer hunting seasons. Hunting at AEP Recreation Land and Blue Rock State Park. Romantic lodging and accommodations for couples looking for a weekend getaway in Ohio. Couples enjoy celebrating honeymoons and anniversary celebrations. Private and secluded getaway with pond for swimming and canoeing. Visit the heart of Ohio for outdoor recreation and travel to nearby Amish Country. Watch Ohio waterfowl fly in to the private pond from the comfort of the cabin. Cabin features three sleeping areas with queen-size, full-size, and bunk beds. Great for families and hunting camp accommodations. Enjoy outdoor activities all year round on the property or nearby recreation areas in southern Ohio. Relax around the outdoor fire pit, fish in the pond, or hike on the marked trails. Visit nearby pottery shops or take a canoe ride down the Muskingum River. Plan an extended stay visit as the cabin rental has all the amenities of home including a clothes washer and dryer. Other attractions include Dillon State Park, Longaberger Basket, and Local Arts and Culture.